Description: CP 8795 leads an empty coke train northbound at Inver Grove Heights. The rails belong to UP (their Albert Lee exCRIP "Spine"). 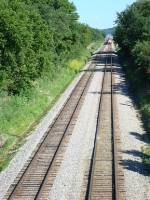 The train came off UP's Roseport branch (exCGW). Description: CP 8795 and Soo 6036 were caught running light eastbound during the flood detours. Photo taken just east 68th St. on State St. Description: CP 2816 sits at Bensenville taking on water as CP ES44AC 8795 passes by. 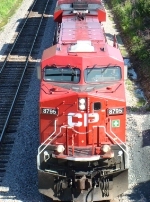 Description: cp 8795 heading south. didnt hear the horn so it snuck up on me a bit. think i had the scanner a bit to loud! Description: Another train re-routed due to the mains flooding at Reeseville begins the long slog towards Madison and Janesville to Chicago by way of the branch line and the WSOR. Description: The next westbound approaches. Description: Note the "backwards" horn...seems to be a quirk of the CP GEVOs. You'd think they'd want the four bells facing forward. 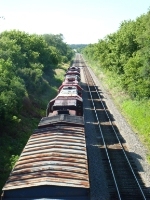 Description: A trio of CP GEVOs lead a Manifest out of Glenwood, MN. Description: Southbound through the interlocking. Description: Westbound approaching the diamond. Description: A pair of CP units hurry northward on hopper train throught the flats at Machens MO. Description: Two GE's (whats new?) handle this CP detour, bound for Dilworth. Description: CNJ and CP inside the roundhouse at Steamtown.